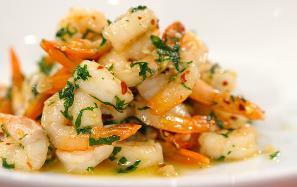 Camarones Al Ajillo (Garlic Shrimp) - Tienditadepuertorico.com - Buy Puertorican Food Here!! Combine butter, wine, garlic, black pepper, sazon and hot sauce. Heat olive oil in non stick pan. Stir fry onion and peppers 3 minutes, if using, if not skip to next step. Pour wine mixture over shrimp. Cover with wax paper that has been poked with several holes using a knife. Cook over high heat for 5 minutes or until shrimp turn pink.